are panting a bit as Gulf Fritillary butterflies hurry over while the going’s good. At Travis County Extension’s demonstration gardens, Salvia farinacea is hosting an “unplugged” bee festival this week. Native zexmenia (Wedelia acapulcensis var. hispida) seeded itself to join the powerful pollinator party. Orange shrimp plant (Justicia fulvicoma) isn’t native, but stayed just as busy with tiny pollinators and butterflies. Blue, orange, and yellow: what a festive dress! When it finally cools down for real, winter annual calendulas fill in the food gap when perennials are dormant and before native wildflowers pop in. No, they’re not native, but these little troupers aren’t fussy about temperature swings. Petals color up and flavor our salads in chemical-free gardens, too. Find out more. In vegetable beds—especially if you’ve worked them heavily—now’s a good time to sow cover crops like hairy vetch, crimson clover and Elbon rye. Not only do they fixate nitrogen in depleted soils, they can control root knot nematodes. Plus, crimson clover’s spring flowers will have bees returning “over and over.” John Dromgoole explains how to sow. How do you pair up plants for eye-popping design? 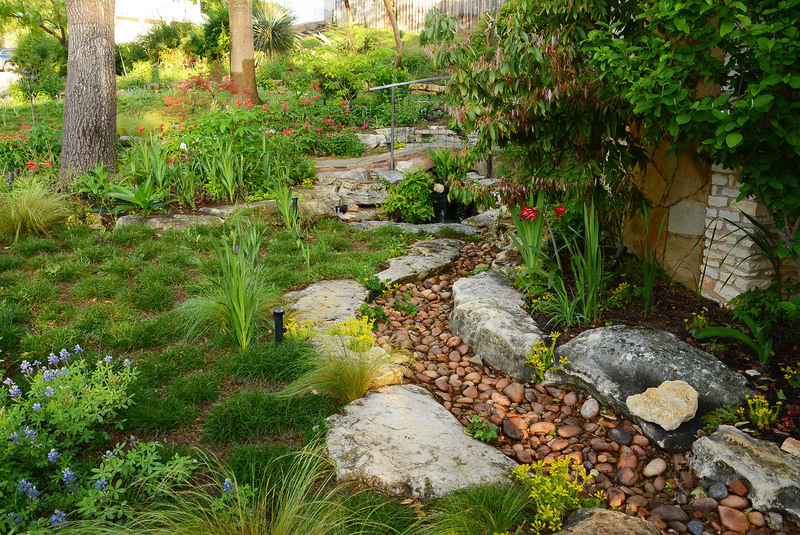 Matthew Davidson from Countryside Nursery shows how to coordinate and layer native plants for a water-thrifty, professional look. Native kidneywood is attracting lots of attention about now, with super fragrant flowers that attract all kinds of pollinators. Evergreen sumac is setting its fruits: edible to us and hungry birds this winter! Watch now for all of Matthew’s DIY pro tips. And check out Countryside Nursery for free classes, helpful, knowledgeable staff, outstanding plants, outdoor décor and organic supplies! Now, another reason to stick with natives (or Central Texas adapted) is our alkaline soil pH. Daphne explains why we can’t really alter it to grow those plants that need acidic soil. Since 2008, I’ve been chomping at the bit to feature author and Digging blogger Pam Penick’s new garden when her family moved to a new house. Finally, last fall she gave us the green light! I’ve followed her adventures since new-to-her challenges landed in her lap: deer, armadillos, flooding, and rocky slopes. And yards of lawn. One of her first projects was to dig up grass for an 8’ stock tank pond, later footing it with starburst of sawn stone. Boxwoods and scavenged culvert pipes round out the circular theme. Bamboo muhly and Color Guard yuccas hug the part sun border against the upper story patio. The house came with a pool, a boon in Texas heat (especially for gardeners). Not only did its circular patios prompt her backyard design, it directed her color scheme. “In fact, the pool determines a lot more than I really realized at first,” Pam said. From the start, Pam had her eye on the existing limestone beds across the back. Gradually, she replaced struggling plants for water-thrifty layers strengthened with foliar contrasts. As she removed grass and created destinations, Pam installed different pathway treatments, one back-breaking wheelbarrow at a time! Here, flagstones and a pattern of the sawn stones connect the pond garden to the central walkway. And what’s a garden without landing spots to relax and watch from different perspectives? To color up this patio that Pam views from her office, she chose vibrant, yet restful tones. To give it gentle enclosure, she designed an artistic cinder block planter to showcase her ever-growing collection of intricate succulents. Then, she added curving stucco walls on two pool patios (along with the centered one in back) for a sense of intimacy and to echo the limestone walls with a contemporary twist. In a side yard bordering her neighbor’s driveway, Pam installed a neighborly cedar lattice-style fence, stained dark to recede into the background. “I wanted to kind of create a more enclosed garden feel where I wouldn’t be looking straight into their driveway, but I wasn’t also blocking it all off. It’s not really for privacy it’s just to make you feel like you’re in a room,” Pam told us. In front, Pam and her daughter installed 700 plugs of Berkeley sedge on a berm to replace St. Augustine. Curbside, where the sun hits, plants for pollinators like Salvia ‘Amistad’ join structural succulents that deer “usually” bypass on their daily perusals. At the front door, Pam not only updated the 70’s entrance, she managed pooling water by pulling out the old sidewalk, regrading, and installing concrete pavers. Since lawn scorched in the strip against the house, she exchanged it for a sun-hardy succulent gallery, installed in scavenged tractor rims and a heavy steel pipe. A French drain and underground sump pump direct rain overflow to a dry creek bed on the other side of the sidewalk, where it meets up in back with baffles and stone to slow down flow on the slope. A limestone retaining wall diminishes downpours off the sedge berm. In usual drought conditions, it’s always spilling native woolly stemodia. The carved out granite path near the house allows access to the back and for rainwater to seep in. I love the blue spheres against the silvery-gray! Author of two best-selling books, Lawn Gone and The Water-Saving Garden (watch our past interviews), Pam champions how to turn yards into delightful destinations, without leaving home.